This article was originally published in the Grapevine, print edition. 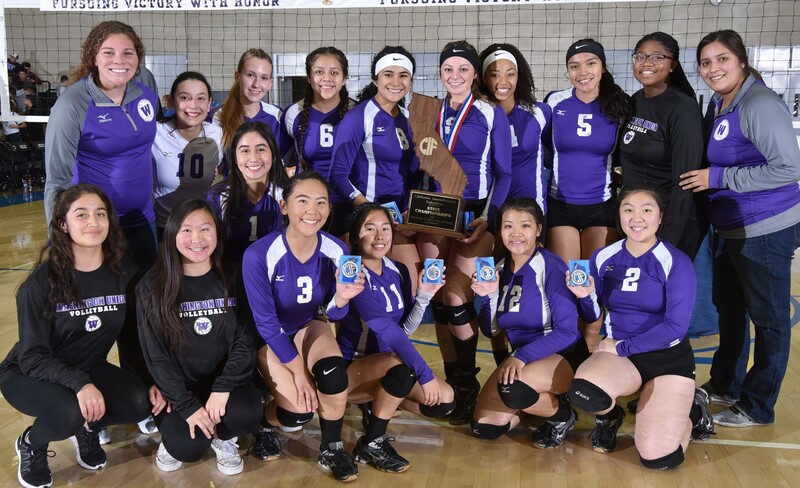 Following a record-breaking season, the Washington Union High School (WUHS) Girls Volleyball Team made history by securing the first State Championship Title in Volleyball for the school. After tying for second place in their league, the team began their road to playoffs in late October by competing in the Central Section CIF Division V Girls Volleyball Championship Tournament. WUHS Athletic Director Jeff Freitas was truly impressed with this team. “Winning a State title requires a tremendous amount of commitment and hard work…Their playoff run of 9 straight wins was historic.” The team worked hard, winning victories over Caruthers (3-1), Kerman (3-0), and Sierra Pacific (3-1). They were able to beat Selma (3-1) for the championship and a chance to compete for the state title. At the state tournament, their winning streak continued, beating LeGrand (3-1), Escalon (3-0) and Vacaville Christian (3-1). Freitas echoed many around the valley when he described the team’s playoff game against Ripon High School, “The Northern Regional Championship win vs. Ripon was one the top five athletic events in Washington Union history!” The Lady Panthers won that match (3-2), fighting for every point after after losing the first two sets of the match. The team finished strong, beating top seeded SoCal team, El Camino, in three straight sets. Washington Unified is truly proud of its 2018 CIF Division V State Champions!